We kicked off the new year with another great meeting. Due to scheduling changes at Otterbein, our meeting location has moved to room 204, in the same building as before. That will save us a couple flights of stairs; the exercise was good, but carrying armloads of stuff will be so much easier! Kevin Rush was elected Recording/Financial Officer; Ed will transition the duties to him over the next several weeks. Our February meeting falls on the 14th. This presents a scheduling conflict for the members who observe (or whose partners observe!) Valentines Day. We may cancel the February meeting. Final determination will be made by 2/7. Some discussion about traveling to other club’s launches ensued. Ed will compile a list of locations and dates for further discussion. Curtis has suggested attending NARAM-59 in Muskegon, MI, 7/29 through 8/4. It’s less than 6 hours drive from central Ohio, and would certainly be interesting and fun. More discussion is in order. Much of the meeting was spent discussing a generous donation from Doug Schmitt. He gave us well over a dozen kits that had been in his basement for a long time. Some are still sealed in original packaging, some have been opened, some partly assembled, and a few completed. There are some interesting classic kits that will be fantastic to fly. The kits that have been started will be distributed to interested members for completion. They and the already completed kits will be considered part of the club fleet, and flown at club launches and exhibitions. The remaining kits may be made available in exchange for donations to the club. It was a cold and snowy night, but we had a great meeting. Ted Decker, a columnist with the Columbus Dispatch, visited and interviewed us about John Glenn’s influence on our lives and passions. We would have spent a lot of time discussing him anyway – he was a true American hero that we all admired. The article that Ted wrote was very well-written; it captured our discussion wonderfully, woven with a great biography of the astronaut. We also talked about various construction and finishing techniques, including efforts to prevent zippering, and use of Kevlar shock cords. We discussed future launches, but decided against a December launch, based on an unpleasant weather forecast. Our November launch was met by chilly, but otherwise perfect weather – clear skies with no appreciable wind. We spent several hours flying various rockets, and had a fun and educational experience. Recoveries were generally very good, but we had some interesting failures. Ed lost a Mosquito that had seen many years and many launches, due to an apparent motor failure. But he had great results with a couple flights of an Edmond’s Deltie Airshow. That rocket has three balsa delta wing gliders that separate at streamer ejection. Its maiden launch was perfect – straight and true, with beautiful looping glides. With the second launch, two of the gliders took off straight for the trees. Fortunately, Kevin and Deanna persistently searched and found them. We got a good video of the launch, but were unable to capture the glide recovery. We should try to improve our photography coverage of launches! We welcomed a new member, Curtis, and talked about all facets of CORSA. We made plans for the upcoming launch, and changed the start time from 10:00 to 11:00, hoping to avoid some of the morning chill. We also talked about launch fees at our club launches. 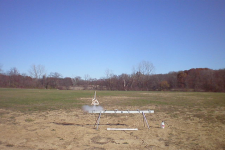 Ed encouraged the other members to use and become familiar with Open Rocket. We plan to post our design files to this website. At our October meeting, the big news was that Lloyd Newman, the founder and director of CORSA, has had to step away from the club for personal reasons. Ed Hingsbergen was chosen to step in as new director. We discussed our experience at the Cub Scout launch, and the things we can do to improve future launches. The 6-pad launcher we currently use is excellent; adding another 6-pad rack would speed up the prep during large launches. We also want to find a tent with sides for use during winter launches, and a PA. In September, we again partnered with Cub Scout troop 701 for a launch at Freedom Park in Sunbury. The Scouts brought and flew a wide variety of Ready-to-Fly rockets and kits they’d assembled. The enthusiasm and excitement of the Scouts was contagious; the CORSA members had as good a time as the Scouts and their families. There were few deployment failures, and few rockets lost. The occasional ignition failure was met not with frustration, but with curiosity and resolve. The scouts were an impressive group to work with, and we hope to have the pleasure of working with them again! At our meetings in April through September, we of course discussed business, and planned a couple launches. We also shared construction techniques and practices, and did some hands-on kit building. This was great experience, for both the beginners and the experienced model builders.